In this episode we have the honour to host Benoît Freslon an indie developer from France and his app EnigmBox. 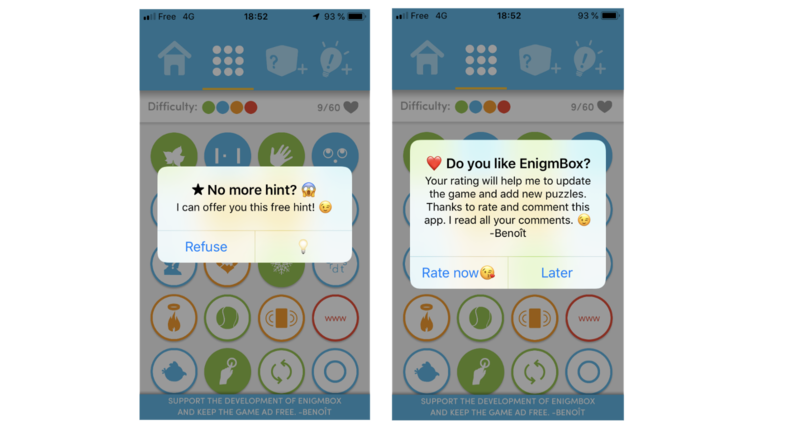 EnigmBox is a creative puzzle game where users have to use different mobile functionalities in order to solve more than 56 puzzles. Users have to move their phone, touch it, take pictures, capture videos, plug accessories, use the location service and many other phone properties to solve the puzzles. EnigmBox pushes users to think unconventionally and out of the box. 🎙Benoît, can you share a few words about you? Hello I am Benoît Freslon, a French professional game designer and a developer since 2006. My main focus is web and mobile games. Most of my games were awarded and played millions of times. I love to design and develop original games that have a unique new gameplay and provide a different game experience. EnigmBox is a really special game because you have to think and play outside of the box to solve different puzzles. 🎙What was your main inspiration for working on unconventional games? My main inspiration was the Psycho Mantis scene in Metal Gear Solid 1 on PSOne. Everyone remember this because it made you think outside of the box and it was original. 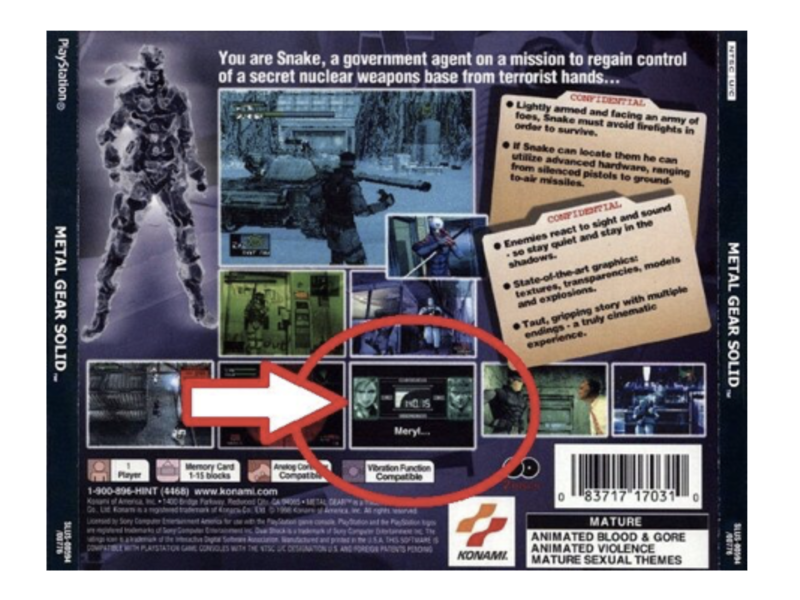 In Psycho Mantis scene the player has to find Meryl’s frequency on the game’s CD cover. 🎙What is the story behind EnigmBox? Before creating EnigmBox on iOS, in 2009, I tried that concept with 2 flash games called: Take Something Literally Episode 1 & 2. In those games the main question was: “Why not playing literally with the environment of the player?” If you step back from your computer, you can see that everyone has a browser with many functionalities, a mouse with 2 buttons at least, a keyboard, sometimes a webcam, a microphone, etc. So, everything around me was inspiring to think outside the box. I developed 25 puzzles in only one week and I just put the game on the web. Actually, I thought it was just a tiny experimental game. The concept was risky because some people didn’t have the required devices to solve some puzzles like a webcam, a microphone or a printer. Their game experience was a little spoiled, but for the others it was amazing! In fact, it was a huge success! That game has been played million times, it got many reviews and I got many encouraging comments to make new episodes. In 2013, after many fails in mobile games with publishers, I decided to develop my “last mobile game” alone. But this time without a publisher, without resources and in a few months. I wanted to develop this game as fast as possible with a simple design but with an interesting gameplay. At the beginning of the project, I just looked my smartphone and then I tried to think how a player could interact with the game in any unconventional way. I found a ton of new ways to play. That was maybe the most exciting part of the game development process. My main goal was always to publish an Android version and reach the Chinese market with it. 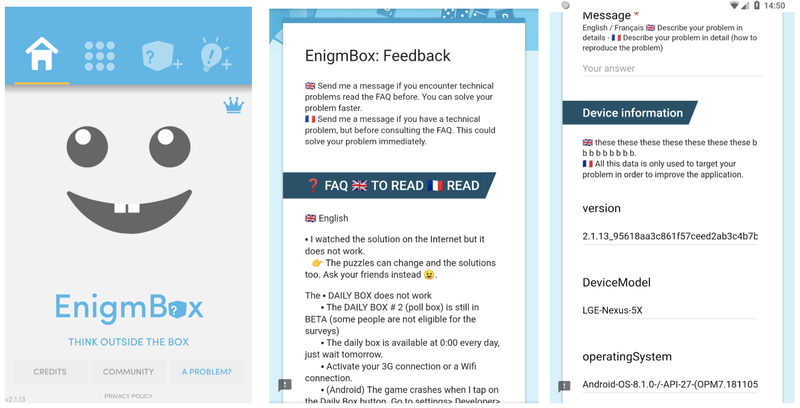 In December 2017 I republished EnigmBox 2.0 both for iOS and Android. 🎙What is the current status of the game? EnigmBox 1.0 was released in August 2013 on iOS. 🎙Which engine did you choose and why? For the first version in 2013, I developed my project with the cocos2d-iphone framework (the old version of cocos2d-swift). Cocos2d was a native Objective-C game engine that was perfect for using all the native functionalities of an iOS device. For the second version of 2017, I chose Unity because I was already familiar with the engine through other projects. 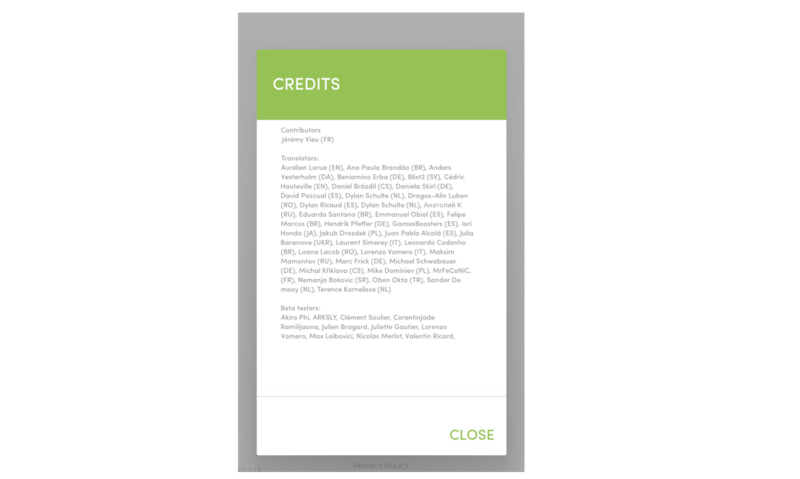 Unity is also free to use and I had the knowledge to develop plugins to use the native functionalities for both iOS and Android. I believe it’s a perfect tool for indie mobile game developers. 🎙What other tools do you use and for which purpose? Google Analytics — Since 2009, I have always worked with Google Analytics, not just because I love to watch in real time the world map of the players, but because I can track any game data and all other metrics. I’m focusing on the data to polish the game and on the retention rate by checking the difficulty of the puzzles, the time passed on each level, the number of hints used on each puzzle, etc. I know the progression of all the users and when I lost them. This information is crucial in a mobile game to improve the overall retention and the game experience. GameAnalytics — Easy and fast to implement, this tracker can also report Unity error logs. Very useful to track any bugs or issues. Facebook SDK — The first time, I installed this SDK, was for using Facebook connect in order to share automatically on Facebook and display the “Like” button in the app. But now, the SDK is essentially used to get more information about the game’s audience. OneSignal — I use this SDK to send push notifications through the game to all of the users. I always used this SDK for my games. I usually send very few push notifications, only for bug updates and important news (2 to 4 notifications per year). Unity Analytics — This SDK is already almost installed by default with Unity Services. Once plugged with Unity Ads and Unity In App Purchases plugin, all the data are automatically reported. Other native plugins are also used within the game to help using all native features on each OS (alert box, cloud data, permission, photo library, etc.). I prefer to purchase third party Unity plugins in the Unity Asset Store. This way I gain a lot of development time, but sometimes some plugins turn out to be out of date or not compatible with the actual versions of the OS of the game. 🎙 How did you choose the order and the content of the levels? First levels are like tutorials, the player should understand the game mechanics and the originality of the gameplay. Then, I introduce some new concepts of interactions with sensors, native UI elements and others, in order to push users to think outside the box. After the tutorial, there is no real order, because players can choose any available puzzles. Naturally, players always play puzzles from the left to the right. So, the first levels are sorted in order to create a rhythm, a progression, by increasing difficulty progressively. To get the difficulty, I tracked a lot of game data with Google Analytics. With the use of Google Analytics every hint used for solving a puzzle within the game is tracked. This way, the most difficult puzzles are revealed. Based on those data, puzzles are provided in a way to create progression and challenging puzzles are shown after a few wins by the user. Moreover, by measuring the win rate per puzzle, actions are revealed that should be taken to improve a puzzle and help users move further in the game, increasing this way the retention. From the screenshots above we can see that players drop off after the 4th puzzle, just after the tutorial. 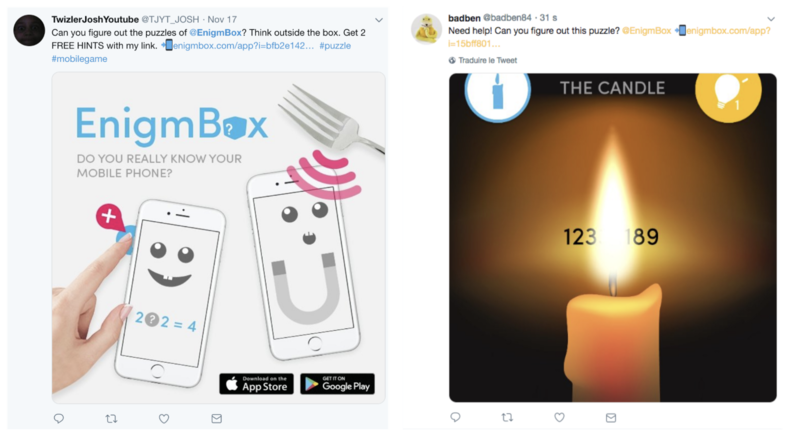 This insight shows that the 4th puzzle should be improved and maybe less app permissions should be asked by the user in order to enter that puzzle. To conclude, the first puzzles introduce the concept of the game. 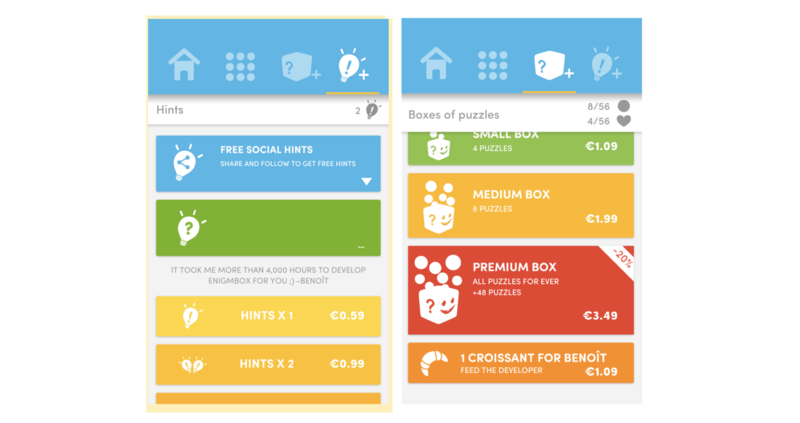 Different puzzles are arranged with the help of analytics. I always try to add a “WOW effect” in order to keep the players as long as I can, until the “paywall”. 🎙 We see that you have a feedback form within the game. Do users use it? Yes, I always put a “Feedback” button on the landing page. It’s very visible and I think that it also reassures the player. When users tap on the button, a pre-filled Google Form appears. Important data are filled like: the app version, the OS version, the phone model, the language, the user id, etc. Before posting a message there is a FAQ section. Players have a chance reading this short help, prior sending a message. It’s a wonderful gain of time for me and also for all the users. Once feedback is submitted, I receive immediately an email in my mailbox and I can answer directly to the player. This is not only better than reading bad reviews on the App Store, but also efficient because you can ask questions and solve problems faster. Only 50% of feedback received is relevant to actual problems. In most of the cases, players think they found a bug because they can’t solve a puzzle. I always check and give them a solution as fast as possible. 10% of the messages received, are from people that would like to write a nice message to me, just to say that they love my game. 🎙 How do you handle user ratings and reviews? Do you receive any actionable feedback? I try to introduce myself in the game. I always speak in my name by signing all my messages to the players. Most of the players are really comprehensive. I ask them to rate and write a review the first time when the player is running out of hints. 90% of feedback is just a nice message like “Awesome”, “Cool app”, “I love that game” etc. But some of the messages are addressed to me directly because players know my name. Every time, this makes me smile. 5% of feedback are people who need to fix an issue. In Google Play Console, I just look immediately the device, the version of the app and a lot of crucial information before answering. Then, the 5% left are just players complaining because they want more free hints and free puzzles. I usually just send the same message to them, to explain how to get free hints or free puzzles. That’s sad, but players are conditioned to play conventional Free 2 Play games without any limit. 🎙 We see that you maintain some communities like on Discord. How does that help dealing with the users of the app? 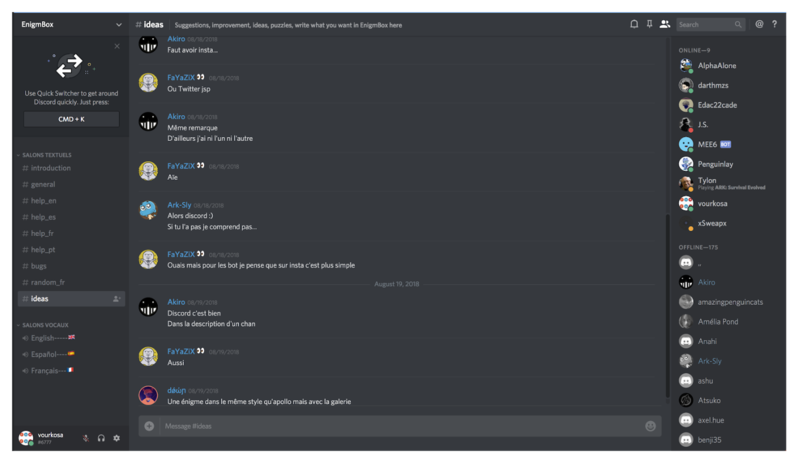 Discord is a hyper efficient channel/tool for the gaming community. Everything works in real time. We can chat with players and they can share their game experience or any other issues with me. I believe they like to chat with the game developer of the game. I created also there a beta tester group , in order to test new puzzles. Users are very active and they are willing to help when a new user asks for a new language. They also respect the main rule: “DO NO POST THE SOLUTION HERE, JUST HINTS!”. One more cool thing is that the Discord community works and evolves on its own, without the need for any other further action or support by me. 🎙 What is your monetization strategy? The game is a Free to Play. There are 60 puzzles in the game at the moment and there are no intrusive ads. The first 24 puzzles are free. Users can buy puzzle boxes, hints or a croissant for Benoît! A lot of players complain because they want a free and unlocked game forever. If players don’t want to pay, the rest of the puzzles can be unlocked by watching a video ad or by filling a survey (beta). They can get 2 free puzzles every day and this increases the retention rate. The ads are an alternative, but the revenue is very low compared to the IAP. The game is experimental and therefore I wanted to give it for free to people to download and play. Hints are still a good IAP option for all the puzzles in the game. The first levels are free, but not the levels after. 🎙 Social mechanisms, how do they help? Players can get free hints when they like the EnigmBox’s Facebook , Twitter and Instagram page. Same when they share the game on social media. According to the stats, players prefer to share on Instagram. 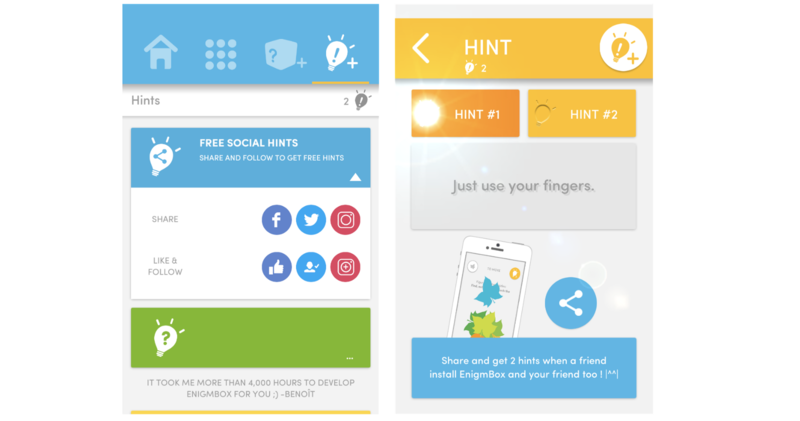 Players can also win free hints by sharing a screenshot of the puzzle with a link to download the app. This approach brought around 2.4k more downloads to the app. Players can interact with their friends and ask for their help. 🎙 Do you use localisation? How did that help in acquiring new users from different regions? In 2014, when a Russian player of EnigmBox helped me to translate the game in Russian, I was really surprised to see how many Russian players downloaded the game just after the translation. Localisation is crucial if you want to acquire users from different regions. The most important languages are: English, French, Spanish, Portuguese (Brazilian), Russian and Chinese. Actually, I always propose my players to help me translating the game in their own languages. In my case, I definitely know that I will not have a professional translation, but it’s better than nothing. EnigmBox is localised today in more than 12 different languages. 🎙 We see that several sites reveal hints for people to cheat? How do you handle that? This is a very common issue for all games, especially puzzles games. Some people just want to move forward and skip a difficult puzzle. In most of the cases I just send a message to the webmaster to add a disclaimer on the page. I am OK with that, because I know that without these websites, 30% of the players would complain that there are not enough free hints. The funny thing is that if I update a puzzle to change the answer, a lot of players will complain that the answer on another website doesn’t work. Sometimes, I prefer uploading the video solutions myself . 🎙 We can see some YouTube game streamers playing the game in their videos? How did that impact acquisition? When YouTubers play your game, this is a very good way to increase the number of downloads. 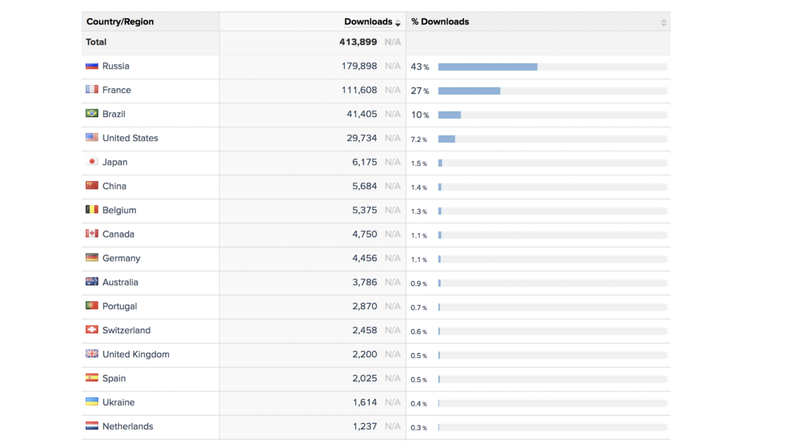 The number of downloads has been increased to 20,000 downloads few weeks after the release. I worked with a PR specialist to reach French YouTubers. Unfortunately, the audience is not always 100% appropriate in some cases. YouTube viewers watch only free content and they don’t usually pay. In some other cases users are too young and they can’t pay an In App Purchase but they are OK on writing a bad review because they expect to find a 100% free game. 🎙 We see that you use occasionally different theming for the app icon? Can you share why you do that and how it affects new downloads or user engagement? Players love to see the icon and the design of the app changed according to all the events. The players see that the app is updated and this grabs their attention. It can also spike the curiosity of the user, to launch the app again. It is also a way to get featured. The app stores love to feature an app that matches with a current event. 🎙 What are the next steps? I’m currently chatting with Chinese publishers. I would like to spread my games around the world as I always did. Chinese is a big market but, as you might know, I can’t handle this alone. I’m also planning to add 20 more puzzles in the game for the next updates.